a formal takeover of parent company Australian News Channel. The deal for the company, which has one third ownership by Seven West Media, Nine Entertainment Company and SKY (UK), is rumoured to be worth $20 million. News Corp will take control of channels SKY News Live, SKY News Business, SKY News Weather, SKY News Multiview, Australia’s Public Affairs Channel A-PAC, SKY News New Zealand and Australia Channel. News Corp executive chairman Michael Miller told staff in an email today, “This is a significant investment that reinforces News Corp Australia’s continued commitment to quality journalism, talent and content. “I’m excited by the prospects offered by this acquisition and to lead a company that is investing in the best news coverage for all Australians. “This acquisition has come about because News Corp Australia recognises the increasing value of SKY News; its employees, the shows they host and the audience it attracts. Australian News Channel chief executive officer Angelos Frangopoulos described it as a “tremendous opportunity to grow and develop talent, content and commercial revenues”. “Today marks an exciting new chapter in the 20-year history of Australian News Channel,” he said. The move means significant video resources for News Corp online. Content from Nine, Seven and SKY will continue to be supplied. Foxtel’s carriage agreement with SKY currently ends in February 2017. No such thing called Quality journalism at News Corp anymore. That’s why News Corp hires Opionist these days rather than Journalist. Journalists deals with Facts, Opionist don’t deal with facts, instead they offer their own Bias Opions. News Corp is bad news for any democratic Country. 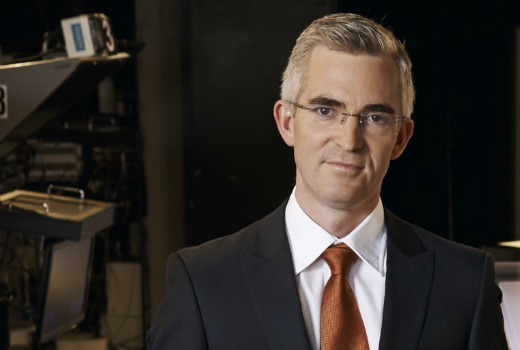 I think David Speers (photo above) would not agree with you, Newscorp papers and other news commentary outlets got a lot of value from his SKY News interview with Mr Turnbull, I don’t think he’s on the LNPs Christmas card list. Quality journalism, that’s hilarious. Quality journalism & Murdoch do not go together. Cheap nasty trashy outdated dinosaur of right wing biased garbage of the most extreme kind with every on air presenter only qualification is to have been or currently is a member of the liberal party .thats what sky news was and is .poor mans version of Fox News in Amercia ,with the same biased views .and they have the gualle to attack the ABC for being based . Ah yes, great liberal party heroes like Kristina Keneally and Graham Richardson. It’s hard to believe Latham was ever leader of the Labor party lately. Cheap nasty trashy outdated dinosaur of left wing biased garbage of the most extreme kind with every on air presenter only qualification is to hate Andrew Bolt, the Liberals/Nationals and anyone that dares to challenge their so-called experts. Q&A is just a hour for left wing bigots to whinge about everything that is bad about this country. That is what ABC was and still is.. A left biased publicly funded network which does not reflect the views of the majority of Australians. It’s just a jump to the right. Watch this space, as News Corp are trying to entice more subscibers to their print and online models, this could be an added bonus. May as well call it Fox News and be open about the fact it’s a biased right wing ‘opinion’ channel that has very little to do with news. one would imagine a takeover by new corp will just make it a televised version of their tabloids and it’ll become even more politically biased. One wouldn’t as long as seven and nine are supplying the actual news footage which according to the story they are. It was already halfway there. Now its transition to Fox News Australia can finally be realised. The dream has already been realised once before, featuring a man famous for “keeping the dream alive.” But it was short lived and had very little Australian content. I wonder how long it will take to announce the FTA channel launching on Ten’s spare channel. My thoughts exactly. If it happens, don’t think 7 or 9 would allow vision they will continue to supply to Sky News to be broadcast on a TEN multi-channel? More so as TEN don’t pay for any News Chopper vision that 7 and 9 now share the costs in. Nine and Seven would no doubt get upset, but that would have nothing to do with the channel having a number starting with 1 (in metro areas). It remains to be seen how much longer Nine and Seven choose to supply footage and programs. Both produce so many news programs now that each wouldn’t find it difficult to launch their own channel on every platform but Foxtel. If the Australian ad-supported FTA market fails, the main value that Nine and Seven have left is as trusted sources of news. It will be good for Sky to get an injection of cash. I just hope a balance of voices is kept in terms of editorial content. Sky News does need a bit of a revamp as it’s starting to look a bit politically biased and tired, as a news and current affairs show the changes made before the Federal Election have not done much for content, Sky just appeared to add a few more shock jocks to the opinion roster. It’s time to return A-PAC to its former full screen version and tidy up Sky News multi-view so all shown available content there can be seen in full screen as well. “it’s starting to look a bit politically biased” Ha,you ain’t seen nothing yet.A Foxnews of the South Pacific would be my bet.